Rip Rap is a small farmhouse bakery in operation since 2008. They grow some organic ingredients for their crackers right on their farm and source the rest of the ingredients locally. Their crackers are hand crafted in small batches, and it shows. 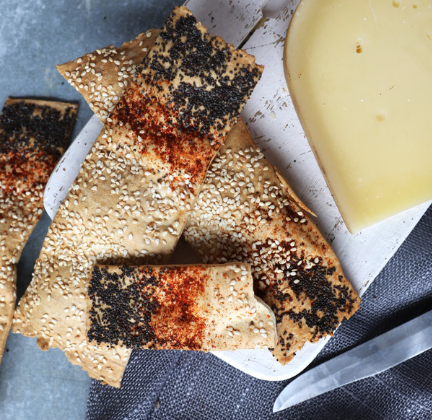 We’ve always loved Rip Rap crackers for serving with cheese, dipping in hummus, or most commonly, just snacking on them straight. The Rip Rap crew recently adjusted their recipe and process, just a tad, to make a slightly thinner, bubble-free cracker. It’s a delightful improvement on an already great product. They’ve also unveiled a whole new product line called Snack Stix, which are basically the crackers, but narrower — ideal for those of us who just like to eat them straight — and in fun new flavors. We’re stocking the Meyer Lemon, dusted with a little bit of sugar. It’s great on its own, or on a charcuterie board!